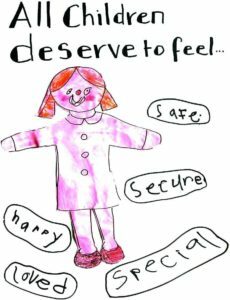 Children need to feel safe. Many of our children were hurt at night, often in their own bed! Some children laid in their rooms and listened to screaming and fighting as their family was torn apart by hate. Night time is hard for these children. When they have an alarm on their door they know no one can sneak in at night and hurt them. We use an inexpensive door alarm to help children with trauma or RAD, Reactive Attachment Disorder to feel safe. A child wounded by past trauma can rest peacefully knowing parents will come quickly to the rescue if anyone opens the door! They absolutely must feel safe to heal. Healthy sleep patterns are essential to sanity. Children with emotional illness often have trust issues. We have found they cannot share a room with another child and heal. They WILL NOT heal if they cannot sleep or if they can physically, emotionally or sexually abuse another child. The alarm helps with all of those problems. We can keep them safe from themselves and those they do not trust when we can know quickly that the door has been opened and respond appropriately to keep the child safe. Put yourself in the child’s frame of mind for a minute: if you did not trust someone at all (serial killer) and you had to sleep in the same room, how soundly would you sleep? It is inexpensive and yet harder to sabotage than many of the others out there. If your child’s room is on the ground floor you may also need to get an alarm on the window(s). I like to tell them that I want them to know they are safe at night so if they alarm ever goes off I will be there in a flash. Then I better be there fast!